Amid the widespread discussion about 'the future of the church,' an important point is sometimes overlooked: tomorrow's church will depend to a great extent on the new pastors of today who will serve and guide our churches in the years ahead. George Mason's Preparing the Pastors We Need: Reclaiming the Congregation's Role in Training Clergy makes a timely intervention, asking us to redefine pastoral leadership by analyzing how, in fact, pastors are made in the first place. 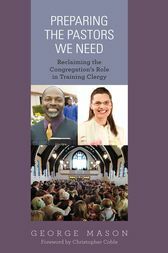 The book highlights an exciting development in the training of pastors: pastoral residency programs and mentoring. Mason demonstrates that these programs work best when the congregations themselves, not just leadership or staff, are an active participant in the training. In this way, churches begin to reclaim their rightful role in the formation of the ministers that will serve them. And, at the same time, they become healthier and more effective churches. Mason gives us the analogy of physician training. Medical school produces graduates with extensive knowledge of the body, but a practicing doctor will require several more years of internship and residency. Similarly, our seminaries and divinity schools produce men and women with good biblical knowledge, but they might not prepare a graduate for the task of helping a bereaved parishioner cope with the sudden loss of a loved one. Moreover, such areas as finances, budgets, personnel management, and vocational identity are also not well suited to seminary study. Mason shows that congregation-based mentoring and residency are excellent ways to bridge this gap. George Mason has been senior pastor of Wilshire Baptist Church since August 1989. At Wilshire, he birthed and directs the pastoral residency program that has become a model for other congregations nationwide. He earned a bachelor of business administration degree in 1978 from the University of Miami (Florida), where he was a quarterback on the football team. He also holds M.Div. and Ph.D. degrees from Southwestern Baptist Theological Seminary in Fort Worth, Texas.